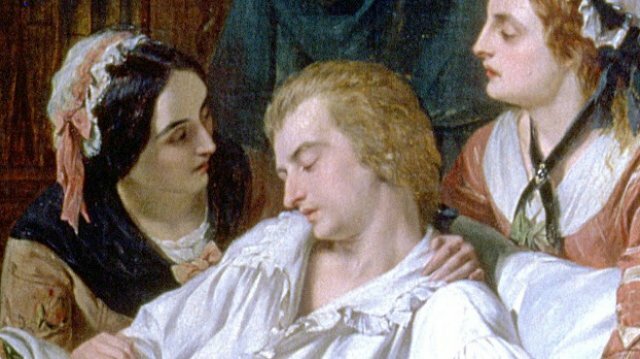 Detail from The Death of Mozart (1870) by Henry O'Neill. The show featured a starry cast of veteran actors (Saffron Burrows, Malcom McDowell and Mark Blum among them) and New York locations to explore the chaos and conflict that goes on behind the scenes at a major symphony orchestra. The show was centered around the"New York Symphony", itself a thinly veiled analogue of the New York Philharmonic and its new boss Rodrigo (Gael García Bernal) an analogue for such young firebrand conductors as Gustavo Dudamel and Yannick Nézet-Séguin. The production avoided Carnegie Hall and the New York Philharmonic's Lincoln Center home. Rather, the Public Theater stood in as the exterior of the New York Symphony's home. Since that Greenwich Village venue is not suited for symphony performance, interior scenes were shot at the huge concert hall on the SUNY Purchase campus, north of the city. Although its sense of perpetual, manufactured crises could prove wearing for those who work in the classical music industry (such as your humble scribe) there were many moments where Mozart hit the mark. This writer even saw an analogue of an early experience of his when a podcaster played by Jason Schwartzman killed an interview by asking an older conductor about his young, ambitious rival. The second season of the show was its high point, featuring a galaxy of guest stars from the music business. Memorable cameos included appearances by the violinist Joshua Bell and Dudamel himself. The series also made extensive use of music by Mahler, Berlioz and of course Mozart, and had a superb and thoughtfully assembled soundtrack for Hayley and Rodrigo's adventures. The series, which first aired on the Amazon Prime streaming service in 2014, was based on a tell-all book by Blair Tindall, herself an oboist and the model for the show's heroine Hayley Rutledge. However, the show struck a more comic tone than the book did, delving into the betrayals, personality conflicts and complexities of getting a huge orchestra to play in sync, and showing the musicians, donors and administrators in a humorous light.